I was surprised to find out that Orange Whisk Restaurant and Patisserie is actually a big chow down restaurant behind what appeared to be a small facade in front. It can easily seat 70-80 guests. This restaurant had its soft-opening last January 2, 2015 and is actually the second the branch. 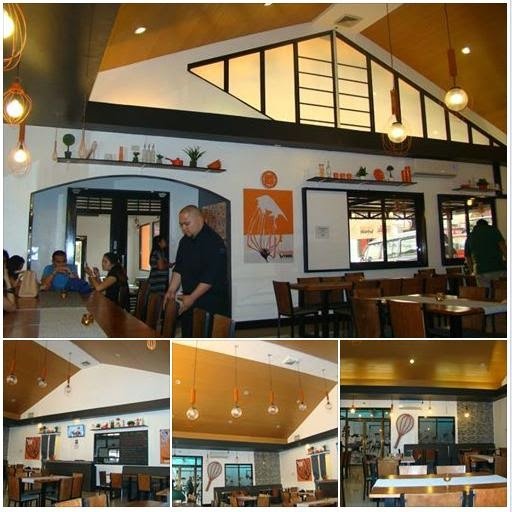 Orange Whisk offers a wide variety of western delicacies, a slew of Filipino comfort food with a twist plus pastries. Ceasar Salad provided the perfect appetizer for the degustation experience that would follow. I love the Parmesan cheese sprinkled on top of the crisp romaine-lettuce, bacon bits and croutons. It tasted awesome! Next in line was Garlic Portabella and Bacon Parmesan Cream Sauce Pasta (P 280). I love the flavor it gives. Kare-Kare with Bagnet (P 310) is deconsctructed Kare-Kare. The vegetables, sauce and Bagnet are arranged and presented separately. Using a slow-cooked crispy pork belly instead of the usual tripe or oxtail makes it more appealing. Bagnet is made tender and soft inside through slow cooking. I love the way it blends well with the creamy saucc. Laing with Bagnet (P 310) is Orange Whisk's take on this Bicol dish. The dried Taro (gabi) leaves, stalks and root crops were cooked with coconut milk plus ginger, giving it a savory, creamy flavor. Biting into the crispy Bagnet gives it added texture. Kitayama Wagyu Burger Steak (P 390) is served with mashed potato. The soft and juicy wagyu meat is garnished with sliced mushrooms and thick gravy. Seared Wagyu Saikoro Steak (P 698) is a popular, Izakaya-style Japanese Steak. This diced beefsteak is pan-fried topped with greens and ponze soy sauce, giving it a subtle flavor. Orange Whisk is also known for its chewy buns and delectable desserts. 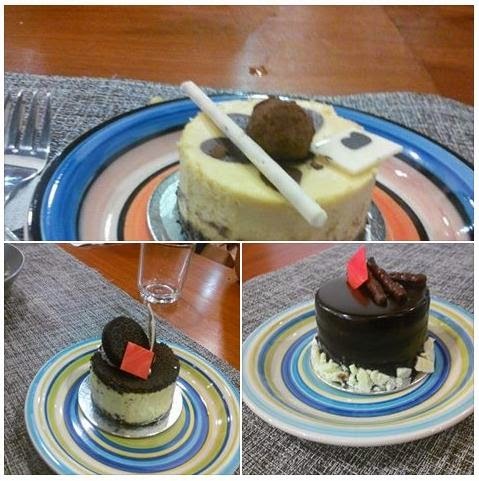 I so love the Mango Graham Cake, Oreo Cheesecake and the Red Velvet Cake! These were more than just eye candies--each tasted heavenly! Orange Whisk is truly a haven for the sweet tooth! Your family will surely love the gastronomic experience Orange Whisk has to offer. Try it out soon.